Ju-yeon, daughter of a retired police chief, falls victim to brutal serial killer Kyung-chul (Choi Min-sik, Old Boy, Sympathy for Lady Vengeance) when her car breaks down one wintry night. Her fiancé Soo-hyun (Lee Byung-hun, The Good, The Bad, The Weird, A Bittersweet Life), a top secret agent, receives information on the police's top four suspects, and then decides to track down the murderer himself. He vows to do everything in his power to take bloody vengeance against Kyung-chul, beyond simply just killing him. As the hunt intensifies, Soo-hyun does everything in his power to take bloody vengeance against the killer, even it means becoming a monster himself. 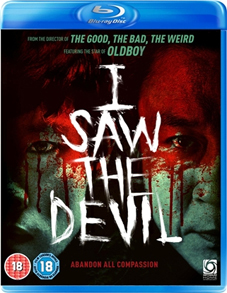 From Kim Jee-won, the director of A Tale of Two Sisters and A Bittersweet Life, I Saw the Devil (Akmareul boatda) is a striking, gripping and very violent depiction of the lengths a man will go to for vengeance, described by Scott Tobias at The Onion AV Club as "a mesmerizing study of the nature of evil itself."